I was asked today by a great customer and friend for an eye candy day, so I thought I'd show you a couple of my own pieces. These two necklaces took a lot of time to make, and I originally made them for myself for my video interview for the Bead Soup book. The first one is the one I wore and the one I'm keeping, but the second one I'll be offering for sale at my next show. The first piece I had in my mind but was having trouble translating to actuality -- do you ever have that happen? I knew I wanted the vintage lucite flowers from The Beadin' Path to have colorful stamens, but I didn't want to have to link the seed beads to chain. With all the other dangly bits on the necklace, I knew the chain would just get all tangled up and I'd have a mess. So I went to waxed linen. I liked the Bead Soup I mixed up for this, and when it came down to the ribbon, I tried out several different colors before settling on the red. I wore this with a very pale pink sweater. The red popped. 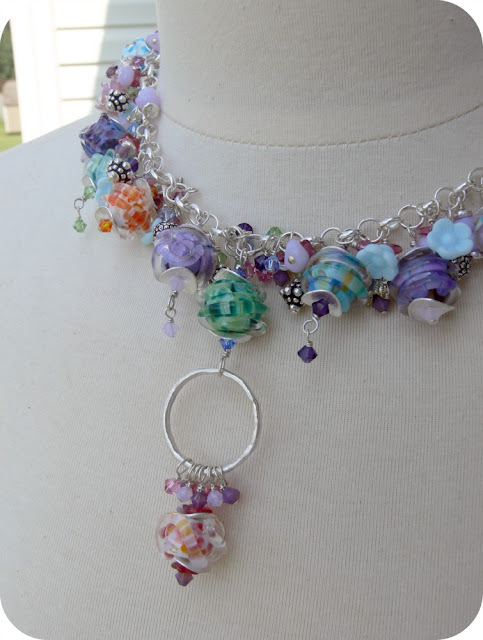 In a way, I wish I'd make the necklace fuller, but if I did, I'm afraid I'd lose those pretty bell flowers. Now on to the second one, which is actually the FIRST one I made and intended to wear. I had a lot of lampwork glass beads, lots of colors of crystal, and I fused a large silver ring to make a pendant drop. I started working, making every other dangle a double dangle, and adding bits and pieces in between. The result is lush and absolutely gorgeous -- but totally the wrong colors for me when I put it on. 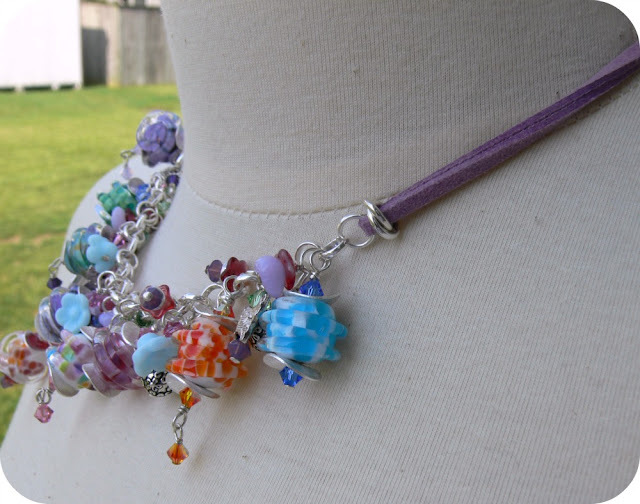 There are HOURS of time in this necklace -- not just in all those tiny crystals being wrapped, but choosing the colors. Putting together a seemingly random mix of colors is not random at ALL. You can't have a blue too close to another blue, and you can't have one rogue purple hanging out all by itself like a glass sore thumb. And then, choosing WHICH crystal to go with WHICH color of bead -- oy. LOTS of work. So when it didn't turn out for ME -- God bless the bunnies but I was not happy. Again, I went for a fiber neckline, this time soft faux suede in a pretty purple that I got from Barbara Lewis at BeadFest last year. That double love knot I made is to keep the folded cord together and having a sleeker appearance on the neck. So there you are -- two necklaces, both made for a Bead Soup book interview (and the book's not even finished, but almost), and one will be sold. And maybe the other one. I can't make up my mind. But I'm curious if you make this sort of thing (full, crazy, dangly) or are more of a simple, elegant-styled person. And share your links in your comments to your eye candy pages! Quote of the Day: "Would You Be Proud?" I always did love your full dangly bracelets, so no surprise I think both necklaces are very pretty, if I was picking for me it would probably be the second one as I am more of a blue and green person, but both are quite lovely! Since my style can best be described as schizophrenic (from day to day you never know which "me" is going to show up) I've done sleek and I've done lush and everything in between. I like both of the necklaces although I probably lean a teensy bit more towards the second one but that's just because I am a lampwork junkie. Two masterpieces !! They are both amazing and so beautiful ~ I confess my favourite is the one with the pink bell flowers - the colour combination is brilliant. Such pretty pieces Lori and a million miles away from the style of my jewelry. I've never been called elegant but my style is definitely 'less is more' - I never feel I can carry a lot of detail off and I guess that translates into my work. The only really 'dangly' piece i've done was called 'Neptunes Garden' which was built around a bronze clay focal and I just got carried away with. It's rather theatrical to my mind. I haven't even thought of selling it and it sits in my workroom as a decoration. There's a pic at this link"
Very pretty. But, just between you and me, I love sneaking a rogue bead/color into pieces - he-he. I just love making dangly dang things! My bead soup has dangles too. Check it our on Saturday! Beautiful pieces, both of them! I'll admit that sometimes I create things that are big and bold and so not what I'd normally wear. Other times I do go understated and quiet. My own personal taste is typically a bit reserved, but I have been getting more comfortable with a bolder statement piece since I want to wear what I create ;) When that happens, and I go bold in a necklace, my wardrobe is typically pretty neutral. 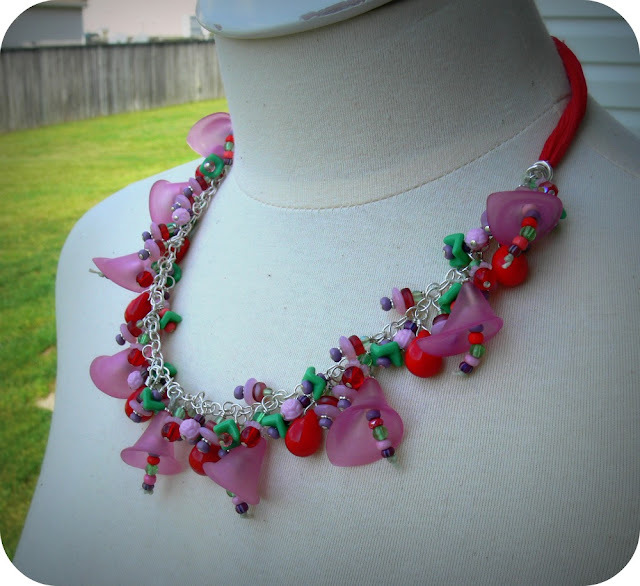 Hi Lori, I really like your eye candy especially the second necklace, although in the first I do like the purple and red together. I'm more of a simple design person with aspirations to be more out there in design. I have that problem too sometimes of getting the design from my head to the actual piece. Those are so pretty! I do love the second one the best, the cool colors look like ice! My goodness are these gorgeous! Thank you for sharing your beautiful creations. You really do have an eye for color. I love the colors with silver in the second piece, my personal favorite. I think most of us have faced the obstacle of having an idea and trying to take it from a vision to reality. It's the figuring out the "mechanical engineering" of a piece that becomes the challenge. You manage to figure out to do that quite beautifully in both necklaces. Love the necklaces. My favorite is the pink one. You did great integrating those lucite flowers. The dangles are awesome, but SO much work. Thanks for sharing your creations. My fave is the colorful one. Can't wait to see what you did for the party. Oh my those are gorgeous!! Tons of beautiful work, that's for sure! Lovely!! They're both absolutely gorgeous but that first one is drop dead eye candy. Holy crow, Lori. It just stopped me in my tracks (around the internet). It's really stunning (in every sense of the word). Thanks for sharing it. I'm putting this photo in my inspiration folder!! Yummy! The first one reminds me of a bright summer day, and the second one reminds me of summer the day before it turns into fall. They are both amazing.I don't where you get the energy to keep doing what you are doing, but keep it up. You are such an inspiration. I love the colors in both, but have to admit that the red and pink has me drolling. WOW, Both of these necklaces are gorgeous! (You know they have to be, I see that word a lot on this page in the comments, lol). They really are beautiful. You have a lot of creativity! Love both,though I would have to tweak each to personally wear...which makes me question why you feel the second "is not you". While it's true I've only seen a profile pic of you on your blog (was drawn to the bead soup web pages), I could see you wearing the second if your clothing was a darker neutral which would make the more sedate colors of the second necklace "pop"! Just an idea from a new blog fan into paper/mixed media beading. The colors and my skin tone didn't work. I'm pale with freckles and for some reason, all the pastels faded me out even more. Rose quartz and I don't get along for the same reason. 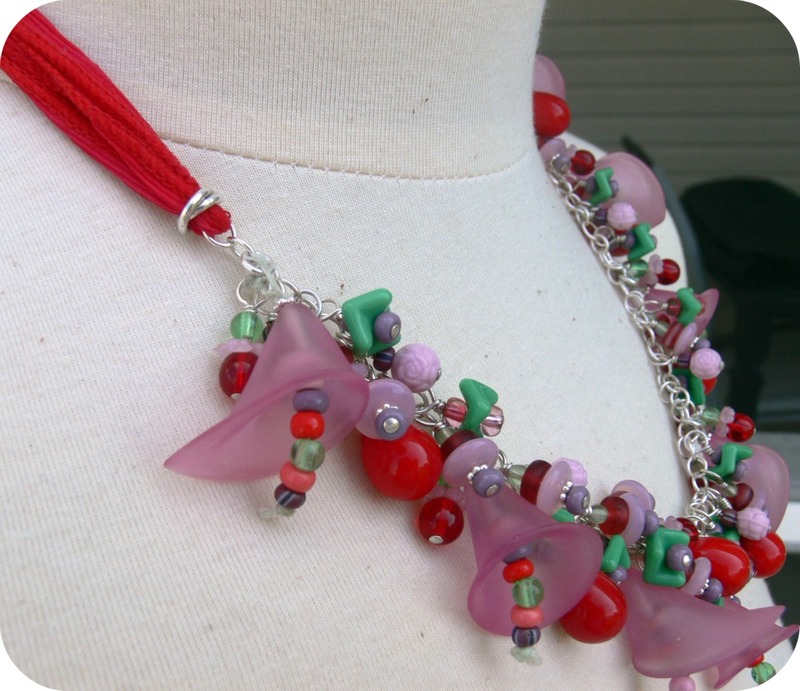 Because I put red in the first necklace, it helped the pastels work for me.